The 5 Commandments For A Restless Entrepreneur! Here at Trak.in, we celebrate entrepreneurship and glorify startups. In the past, we have shared inspirational ideas for entrepreneurs and suggested things which they should do before breakfast, everyday. In one of the posts, we had shared things which an entrepreneur should prevent from happening. In case you wish to know the unmistakable signs of an entrepreneur, then this post will help you find that. Entrepreneurship is a long and consistent journey, and the here are the baby steps to start that wonderful journey. And yes, there are some myths related to startups as well. In this post, you can find the 5 commandments for a restless entrepreneur. No strings, attached. 1 Commandment #1: Don’t follow; Lead. 2 Commandment #2: Think Long Term. 3 Commandment #3: No Weekends for you. 5 Commandment #5: Never settle. Never say, “This is enough”. Keep on Innovating. Commandment #1: Don’t follow; Lead. As a matter of fact, there are no rules for an entrepreneur. You will make the rules, and break them. You shall be ‘above’ rules which are meant for normal human beings. Ofcourse there are some rules like not breaking traffic lights which ensure that there are no accidents. But this commandment is related to entrepreneurship and the world of taking risks. If you started your entrepreneurship journey based on a book written by a failed business man, then God forbid, you won’t go much further. Commandment #2: Think Long Term. There is an ancient Chinese saying that it takes 1000 days for a business to become established. Ironically, there is a similar saying in Gujarati as well, on the same lines. Malcolm Gladwell had shared that it takes 10,000 hours to master a skill. Our ancestors had decoded the secret of entrepreneurship and they knew that it takes patience and perseverance to hit jackpot. There are no overnight success stories; it is a result of long nights and extended work-days to make that super success. Commandment #3: No Weekends for you. Terms like weekends and holidays suit those who are salaried employees and work for others. Entrepreneurs and artists have no weekends. They work full 7 days, if possible 18 hours a day (note: atleast 6 hours sleep is mandatory to stay alive!). Seth Godin had famously said that vacations are meant for those who wish to run away from their existing lives, and spend few days in peace. Passionate entrepreneurs create a life from which they don’t need to escape. Their idea, their business venture is their life. I mentioned Mark Zuckerberg here, because he is the youngest billionaire entrepreneur I know of. Even the wikipedia page for the term “Entrepreneur” shows smiling Mark working on a laptop. Never, ever compare yourself with Mark. You are a unique creature, and if analyzed deeply, you can be better than him. Comparing brings on negativity, and the existing talent may as well fade off. Comparing yourself is actually insulting yourself. Is Mark the ultimate human being for you? By being Mark, you would be fully happy? Why to limit yourself to some random billionaire who created the hottest social networking site? You, are the master of your destiny. Go beyond Mark. Go for it. Commandment #5: Never settle. Never say, “This is enough”. Keep on Innovating. In the America of 1900s, when there used to be no refrigerators in homes, there were businesses which arranged ice by harvesting it during winter months. Employees used to collect ice from outdoors, and using horses, sleighs and saws, used to harvest that. This ice used to be sold to homes and restaurants and offices during summer months. It is estimated that more than 10 million pounds of ice was sold, every year. Even with a cent in profit for every ice cube, you can imagine the profits. What happened next? The ice entrepreneurs settled in. They became comfortable and they relaxed. And then, one smart entrepreneur bought the idea of refrigerators, and the rest is history. 10 million pounds of ice industry vanished because now, the ice was made right inside the home. Never ever settle in. It’s a sin to even imagine that you are comfortable now. Entrepreneurship is not like a rocket launch that after the launch, you can have beer and potato chips for the rest of your life. Rather, entrepreneurship is like gardening: nurturing and feeding the plants, watching them grow, enjoying the flowers and fruits which it gives and then doing the same, again and again. Entrepreneurship is away of life. Keep on living.. keep on breathing. There is no “right” time for entrepreneurship. The time is now. Just do it. 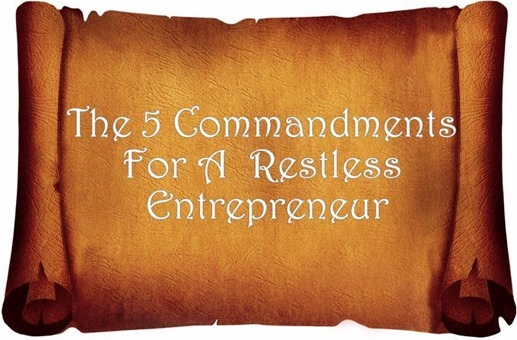 "The 5 Commandments For A Restless Entrepreneur! ", 5 out of 5 based on 1 ratings. Online Diwali Shopping: What You Need To Keep In Mind! How an Entrepreneur Can Inspire The Young Workforce of Today?